Vitamin-R creates optimal conditions for your brain by structuring your work into short bursts of distraction-free, highly-focused activity alternating with opportunities for renewal, reflection and intuition. Vitamin-R breaks down large, vaguely defined tasks into a series of short "time slices" of between 10 and 30 minutes, each with a specific, easily reachable and actionable objective. Vitamin-R features an array of highly configurable visual, audio and speech notifications that prod you back to your task as soon as your attention starts to wander. Vitamin-R allows you to break through the resistance of procrastination and create a positive feedback loop of small achievements that get you closer to your ultimate aims. Task switching is a big, but often unavoidable productivity killer. Vitamin-R makes it as efficient as possible and the built-in "breadcrumbing" technique helps you pick up where you left off. Regular breaks are not for slackers. In fact, they are especially important for people who work with high focus. Vitamin-R's timed breaks make sure that your renewal break does not turn into a free afternoon and the "priming" technique allows your intuition to work overtime before you even start on an objective. Each one of us is different. Find out what works best for you and unlock the key to true productivity. 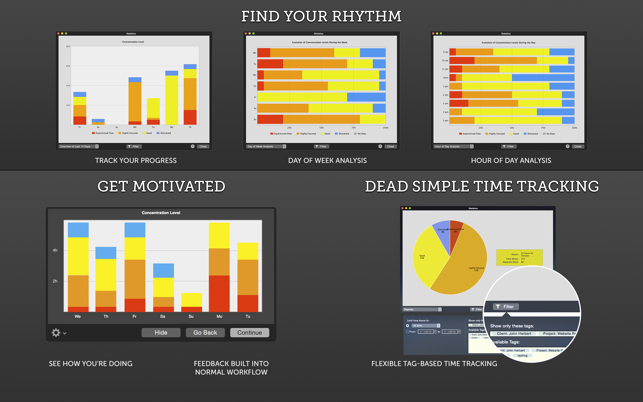 Vitamin-R provides the tools to gain improved awareness of your preferred work methods and rhythms. 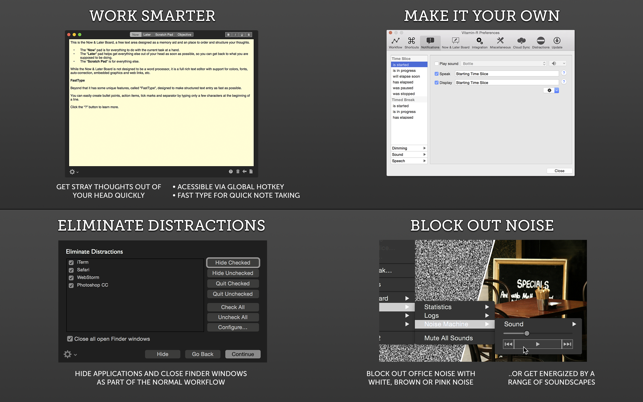 Armed with this new knowledge, you can eliminate unproductive work patterns. Did you know that your short term memory can only hold 4-6 "chunks" of information? The slightest interruption and it's all gone and you have to start from scratch. That's why Vitamin-R provides you with the "Now & Later Board", complete with FastType magic, to give you a place to quickly dump all those things that go through your head and allow you to quickly return to your task. Vitamin-R plugs into your life rather than trying to take it over. You can use it occasionally to overcome procrastination or mental blocks or re-organize your entire working life around the concepts that it embodies. Vitamin-R integrates with traditional to-do list managers rather than trying to replace them. The built-in noise machine can block out irritating coworkers and create energizing soundscapes. 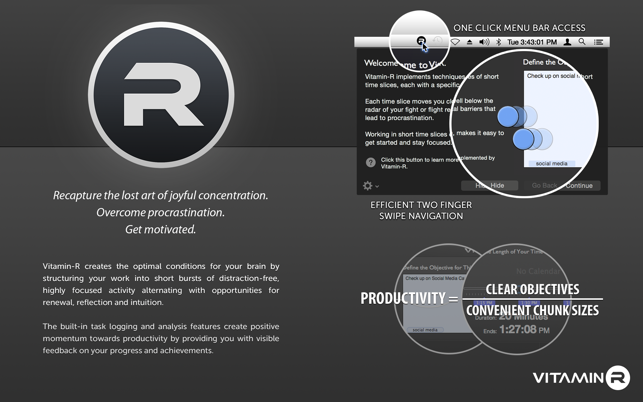 Vitamin-R helps you reduce distractions by automatically eliminating desktop clutter and hiding unrelated applications. 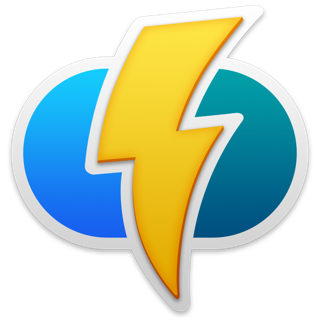 Vitamin-R for Mac seamlessly syncs with the iPhone version and multiple Macs via its simple Dropbox integration, so you can log your time slices wherever you are. Vitamin-R provides everything you need to implement the Pomodoro Technique: sophisticated timer, log book and analysis component. While Vitamin-R was never specifically designed with ADHD "sufferers" in mind, many ADHD-ers have found its approach to focusing attention invaluable. 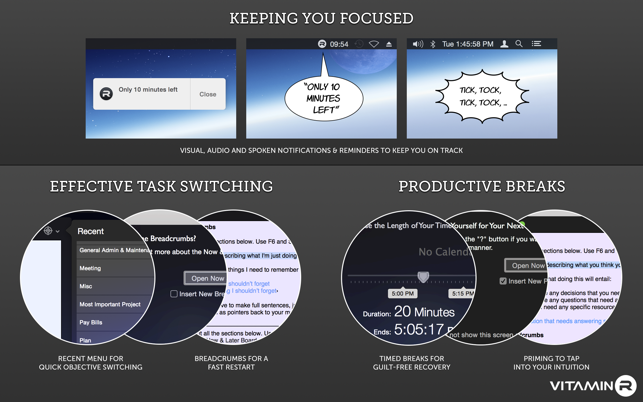 App has been very helpful and instructive for focusing and keeping attention on the task at hand. One thing that I would really like would be the ability to change the color of the time-slice 'Statistics' catagories (i.e. 'Experienced Flow', 'Highly Focused', 'Good', and 'Distracted')/color scheme. As in the ability to make, for instance, blue represent 'Experienced Flow' instead of red. The current color scheme just doesn't reinforce productivity for me (red and orange don't psychologically seem like great representative colors of focus or flow). Overall, great app though. If it leaves all the other apps open and active even if they are in the hide list (which it does for me) it’s not really much use as anything more than a glorified timer. Sorry about that and thanks for pointing it out. This step should in fact not be visible in the Mac App Store version because of the sandboxing rules that make it impossible for Vitamin-R to minimize or quit other applications. You can get that behaviour by downloading the non-sandboxed version from our website at http://www.publicspace.net/ It will unlock automatically. Somehow the Eliminate Distractions step has made it into the App Store version nonetheless.. we have now fixed the problem and it won't show up in the next version. I hope this helps & sorry for the inconvenience. Really the best pomodoro app out there. Smartly designed, with a rich feature set that can be customized to your individual workflow. In version 1 of the app, it had a tendency to be very unresponsive for me (ie, 2 second lags before responding). In this new version it seems to be very quick. If you don't have the lag problem with version 1, I don't think its worth the upgrade though - and the steep $30 is the only reason why its not getting a full 5 stars. Overall, highly recommended. © Frank Reiff, 2018. All Rights Reserved.